DraperDarkFlow in partnership with Makerere University School of Public Health - ResilientAfrica Network (RAN) invite you to apply and participate in SpeedupAfrica - Africa’s Most Impactful Startup Bootcamp that will gather Africa’s top 100 startups from all over the continent, with Silicon valley/Global Mentors and Investors for 4 days growth and investment focused Bootcamp, July 6th-10th at Ashesi University, Ghana. 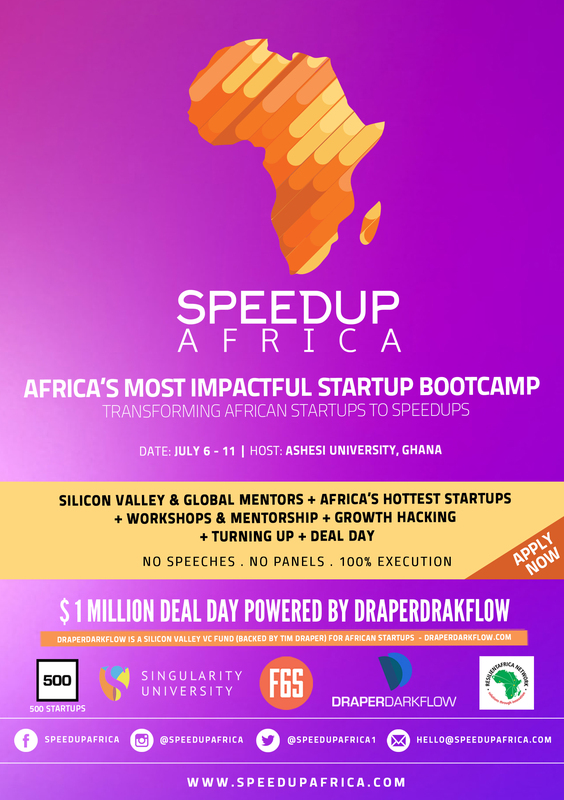 DraperDarkFlow has partnered with 500 Startups, Singularity University, F6S, Ashesi University, & RAN and will along with other investors also invest over $1M in the Most Promising Startups showcased during the Bootcamp. DraperDarkFlow is a Silicon Valley VC fund (backed by Tim Draper) for African startups that can change the world.